TEPPING ONTO A COLLEGE CAMPUS for the first time as a freshman is exciting and nerve-wracking for any young person. But there’s an additional challenge for those who are first-generation college students. They don’t have the same point of reference as those whose parents attended a four-year university and already navigated campus life. They might not have any support at home. And the numbers aren’t on their side. LaShayna Murray can relate. Since her mom had dropped out of high school, receiving her diploma was the top priority in her household. Getting her mom onboard with things like applications and financial aid was a bit of a challenge, but going to college was her dream. She persisted. 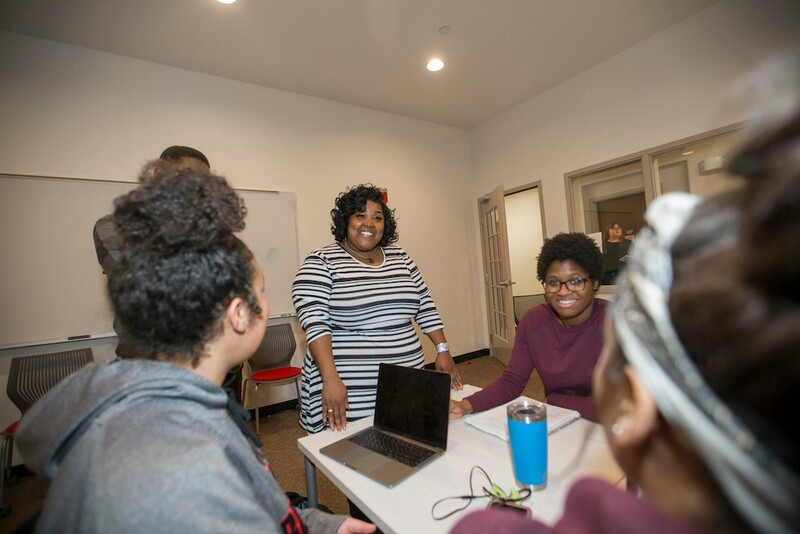 Murray graduated from Taft High School, a Cincinnati public school, and was accepted to the University of Cincinnati just as a new program dedicated to first-generation students like her was launching. Founded in response to alarming statistics — the national six-year graduation rate for first-generation, Pell-eligible students was 11 percent at the time — UC created the Gen-1 program in 2008. 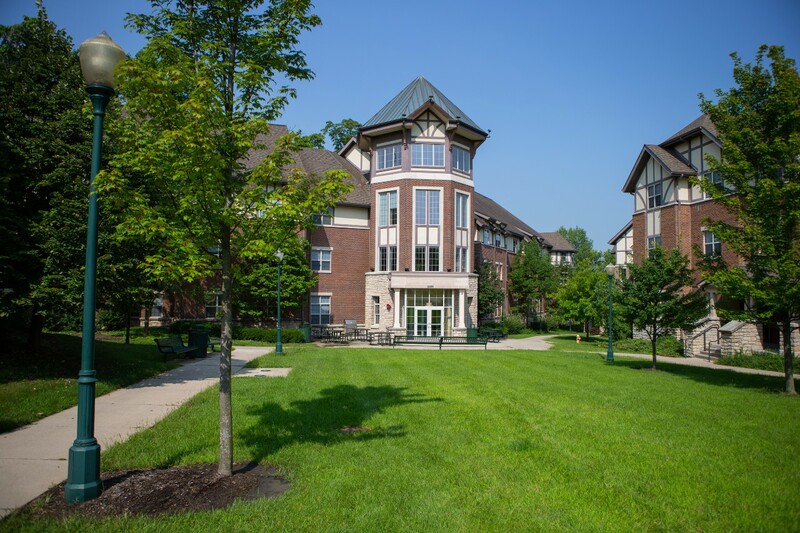 With a focus on successful transition to the university as well as retention and degree completion, a hallmark aspect of the program was the Gen-1 Theme House, which The New York Times has recognized as the nation’s first living-learning community to focus on first-generation college students. Murray was the program’s first student. Fourteen others soon joined her in the house that year, living together on one floor of a building in Stratford Heights, a residential property adjacent to UC’s campus. The rules were tough: Students couldn’t go home overnight or have visitors after curfew the entire first month. They had GPAs to maintain. But it was all meant to help keep the students focused, and they all were in it together. Program coordinator Judy Mause served as something of a house mother, building relationships with the students and their families to keep them on track for success. Now, years after her official retirement, Gen-1 is still Mause’s passion project. In a decade, the program has grown exponentially. Once only open to first-year students, returning students can now remain in the program year after year. Housing expanded across three buildings before moving into the spacious Tower Hall, also part of Stratford Heights, this past fall. Now known as the 1MPACT House (for students that are 1st generation, Motivated, Purposeful, Academically successful, Community-oriented and Talented scholars), it’s home to 94 Gen-1 students and 60 other underrepresented, first-generation scholarship recipients from similar backgrounds. “1MPACT House is an investment by the university that’s grounded in the success of Gen-1,” says director Suzette Combs. The success is real and measurable. While the national six-year graduation rate for first-generation, Pell-eligible students has risen from 11 to 50 percent, the UC Gen-1 program’s rate is currently 78 percent. UC’s first-to-second-year retention rate for Gen-1 students is 92 percent — well above the national rate of 62 percent. 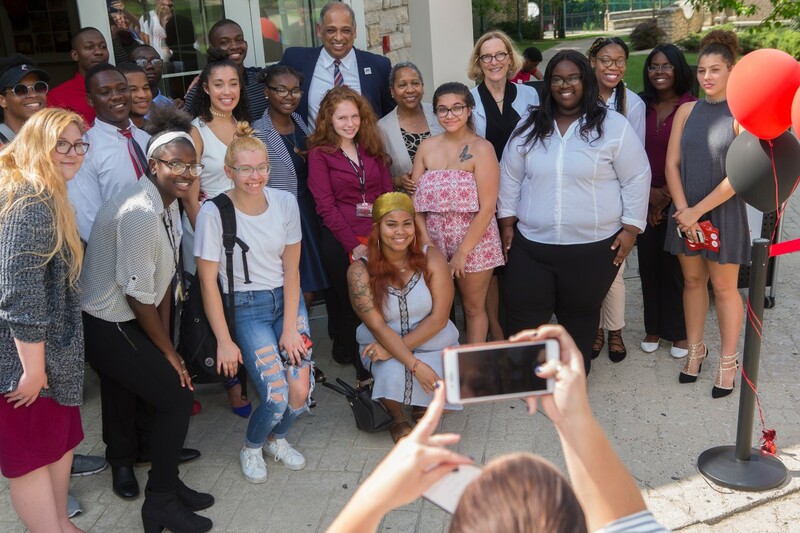 A group of Gen-1 students pose with UC President Neville Pinto, Student Affairs Vice President Deborah Merchant and Provost Kristi Nelson during the opening of the 1MPACT House at UC in 2018. During a recent tour of UC’s 1MPACT House — which features 154 beds, two tutoring rooms, lots of social and study spaces and a restaurant-caliber kitchen — coordinator Mause and graduate Murray reunited and caught up with director Combs and some current Gen-1 students that make up the more than 300 who have participated in the program since 2008. One such student, Xiyanna Kellogg, is a first-year electronic media major. Because her grandmother works at the university and because she was part of UC’s CPS Ambassadors program, she says she was destined to go here. Still, it has been a major shift learning all the responsibilities of her program as well as prepping for finals and completing projects. Entering a lounge where students are studying for finals, Mause recognizes a familiar face. “Tell her what you’re doing next Saturday,” Combs says to student Jamar Beckham. “Graduating,” he responds with a smile. They make their way to the kitchen, where students can take cooking classes and prepare their own meals. Current student Kellogg discusses baking desserts with UC First Lady Jennifer Pinto before their Thanksgiving celebration. “The kitchen was our favorite place, too,” graduate Murray says. She recalls getting to know her housemates over shared meals and falling in love with Ghanaian food thanks to a student from Africa. The Gen-1 1MPACT House is in Stratford Heights, just across Clifton Avenue from UC's academic campus. As the group swaps stories of cooking, culture and camaraderie, it’s clear that the kitchen really is the heart of the home. As Mause explains, it’s a safe space that’s accessible to everyone. And, if you think about it, people need food to survive, but making and enjoying a meal and having the means to do so is what makes it so joyful. It’s a fitting symbol of college life — to get admitted or earn a scholarship is one thing, but students need support, tools and the space to be successful. That’s what Gen-1 provides for students. As their 1MPACT House visit comes to a close, Mause begins to tell a story. Gen-1 introduced the living-learning community model to UC, where students are intentionally housed based on common interests, majors or other factors. In 2018, three new communities emerged, focused on engineering, leadership and social justice. Three more are in the works for fall 2019 and two additional for 2020. With 83 percent of first-year students living in UC housing and a growing number of returning students choosing to stay on campus, living-learning communities offer even more specialized options.